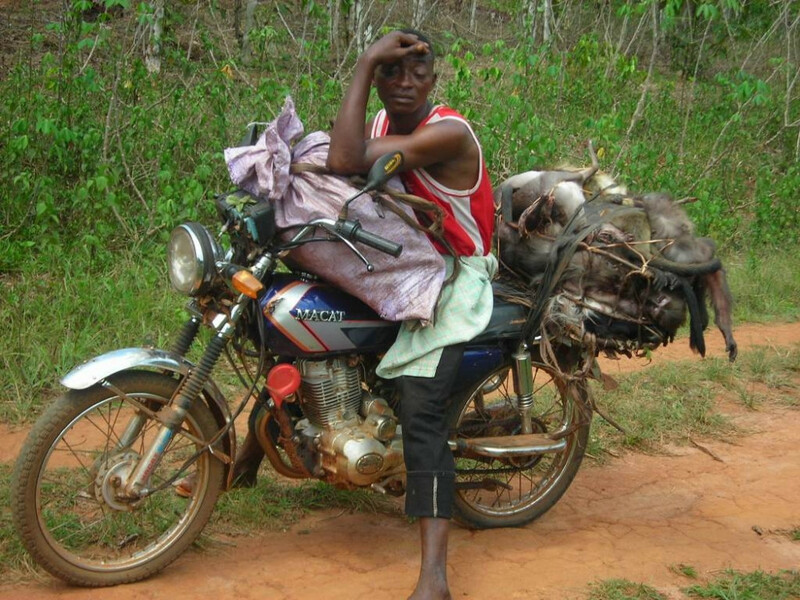 Hunting bushmeat in West and Central Africa is an immense problem. It can even ultimately result in the extinction of endangered species such as anthropoid apes, despite the fact that they are protected across their whole habitat. 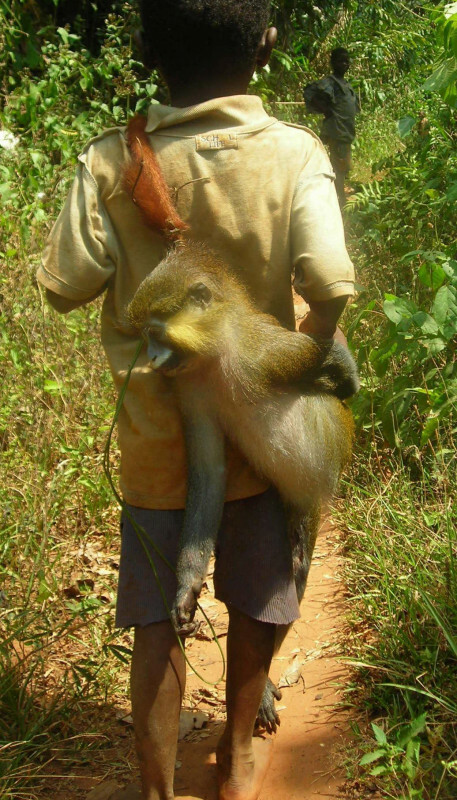 With our Grands Singes Project (PGS) - stationed in the south-west of Cameroon - we are combining scientific research with raising the awareness of the local population. We encourage them to make an active contribution to nature conservation activities in the forests in which they live and from which they live. In attempts to stop the poaching of endangered species, we help the local population to become aware of the laws on the protection of endangered animals and the punishments that the authorities can enforce. In consultation with the villagers, the PGS team also provides support for launching alternatives to hunting such as pig breeding or setting up cocoa plantations with which they can earn extra income. The involvement of the national and local authorities is also crucial in these endeavours. It is very difficult to gauge the intensity of illegal hunting activities. We try to get an idea of the effect of hunting on biodiversity by carrying out surveys of hunting activities on markets and among the population, and by quantifying the amount of bushmeat. The answers from the hunters and the bushmeat they make available for documentation probably gives an incomplete picture. It is particularly local communities who are aware of the national laws on the prohibition of hunting protected species who will not disclose all their information. Information is also not shared if the surveys are carried out by outsiders or westerners who are not trusted by the hunters. We do observe a trend when comparing data from our surveys from 2001, 2008 and 2014. The number of snares in the forest is falling, and the average number of animals caught per hunter is falling too. More hunters were however counted in the last investigation. That is possibly a consequence of population growth in the area, but probably also of the increase in the use of guns by hunters. Being able to simply obtain firearms, ammunition and inexpensive motorcycles has resulted in a strong increase in commercial hunting in recent years. There is also more hunting of specific species such as anthropoid and other apes. Use of wire snares means the species caught is random. Anthropoid and other apes are hunted on the specific request of restaurants and rich buyers in the cities because their meat is highly prized. Hunting apes generally also means more financial gain in comparison with other species. The transport of anthropoid ape meat to the markets mainly takes place by public transport because different control points can then be passed. Illegal hunting is the biggest threat to the survival of wild chimpanzees and gorillas in this region, and even that of the local populations of smaller species. Project Grands Singes tries to consult with local communities in taking a number of measures aimed at better control of hunting, to then preserve the natural resources of the region and protect anthropoid apes. The key to our approach is that each activity is carried out in close cooperation with the local population. Our philosophy is that all this is only possible with a community that actively and voluntarily takes part in the protection work. the involvement of local authorities with support for the community in their efforts, and where necessary also helping to introduce fauna laws. We also work on offering educational programmes on nature preservation, particularly to the children in the villages. A primary school was opened in one of the villages in Cameroon in close cooperation with the Awely Foundation to achieve the objective in the long term. The Jean-Michel Vichard pour les Gorilles School now welcomes hundreds of children from different villages in the region, and offers everyone education opportunities while devoting much attention to the importance of the preservation of biodiversity, the protection of the natural resources in the forest and the protection of anthropoid apes in particular. Other sources of income and an alternative to bushmeat for their own consumption are also needed to enable the community to use the knowledge acquired and protect their own community forests. This is why we have been working with the population for a long time to for example improve the market economy for cocoa cultivation, or we support small-scale initiatives such as fish breeding and setting up local shops. Besides raising the awareness of the villagers of the importance of biodiversity, teaching them about the fauna laws and making them aware of their rights and responsibilities with respect to the natural resources in the forest, the involvement of national and local authorities is crucial. It absolutely necessary that village chiefs and local officials from the different ministries support the project and the efforts of the community, and also help to enforce fauna laws. This on the one hand increases trust in the project, while also being a deterrent for poachers. Based on our study we advise that the improvement of law enforcement can bring the biggest gains. It is also important to invest more in small-scale development activities with which hunters and middlemen can generate an alternative income. Read the article "A zoo‐led study of the great ape bushmeat commodity chain in Cameroon" by our scientist Nikki Tagg.